On our last day in Telluride, Eric and I decided to give the town's via ferrata a go. We had heard about it a year earlier but didn't look into it and only had a rough idea where it was located. In preparation for this year's trip, I looked it up online and sent a link of a video I'd found to Eric and Steve. Eric responded enthusiastically but Steve gave it only a tepid reception. Seems Steve would rather spend the day eating gelato in town than hang out on the side of a cliff clinging to steel rungs for dear life. Eric actually has a bigger fear of heights and exposure than Steve, but really wanted to give it a try, especially after he'd read that it was rated the Sixth Best Via Ferrata in the Nation. I didn't explain that via ferratas were more a Euro thing and that there were probably only about 10 in this country. I'd brought some gear to Telluride for the effort, including harnesses, carabiners and slings. Eric was a little concern that our gear didn't match the high-tech stuff touted on the video as "absolutely necessary", but felt better after seeing others using similar once we were on the route (it was no surprise that the video was produced by a local guide company who want you to use their equipment and services). 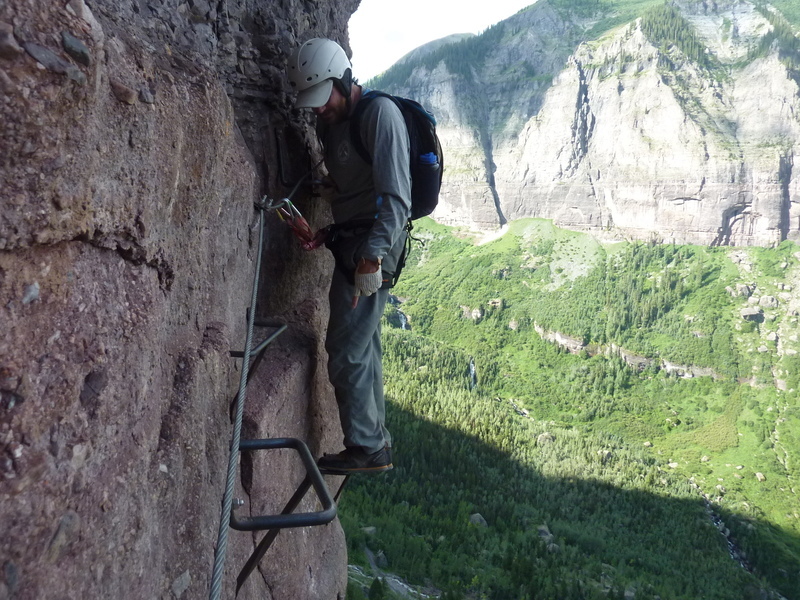 The route follows a ledge system high above the Pandora Mine on the east end of the box canyon in which Telluride sits. A little more than 1.5mi in length, one can travel in either direction but it is recommended to go southeast to northwest (or, right to left) during times of high traffic. We drove up Black Bear Pass Rd about halfway to the power station to find the parking spot at a switchback turn. There is no sign here, but the parking area is shown on Google Maps as the Kroger Via Ferrata (named for the guy who put it up some years ago). Best to figure out where it is before you go. We crossed Ingram Creek on an old wooden bridge leading to some tailings high above the valley, then found one of several use trails leading up to the start. Times vary depending on the party - we took a bit under 2hrs for the traverse at a pretty leisurely pace. The views, as one my expect, are pretty amazing looking down on Telluride and its environs. The first part starts off as a use trail along a 6ft-wide ledge, going several hundred yards before one finds the first clip-in place. Most of the cables along the route are just added security because the ledge narrows considerably in places - a hike with exposure, really. Only a few places have no ledges whatsover and require one to walk along rungs secured to the cliffside. The most difficult of these came about 45min from the start where there is an iron bench with a register to relax, presumeably to allow you to rest while waiting for the party in front of you to finish. This is where the video focused much of its attention, making us think there was a mile or more of this, but in reality it was less than five minutes' effort. We passed a party of four teenage boys about 15yrs of age going in the opposite direction. It was their first time on the route, too, and they seemed to be having as much fun as Eric and I. There were more good sections after this, short but sweet before the route turns a corner and heads north through forest, signaling the end of the technical difficulties. The last quarter mile continues along a good trail, eventually meeting up with the descent route, an old road that takes you back down to Bear Pass Rd, about halfway between the Pandora Mine and the start of the via ferrata. We had had Steve drop us off earlier so he could take the car for a drive, leaving Eric and I to finish up with a walk west back to town, making for an easy, half day adventure.